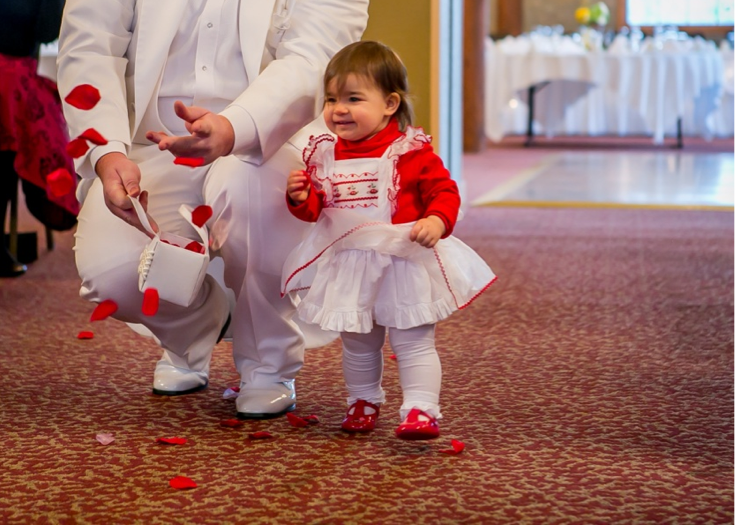 5/13/13-The woman who bought the dress was kind enough to send me professional photos that were taken of the little girl wearing my dress! Just adorable. 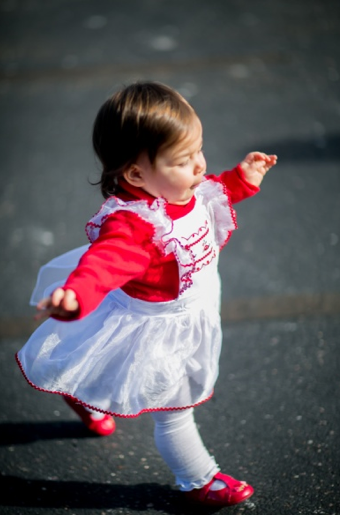 I was recently contacted to sew a custom pinafore for a 14 month old baby girl. The dress will be her fliower girl gown in a wedding. I’m very excited about this for two reasons: I’ve never sewn a garment for use in a wedding or made a pinafore this small! This dress was originally designed by a past customer who wanted to re-create a pinafore she remembered wearing as a child in the 50’s. I left the design of the gown in her hands and drew up a series of sketches matching her description of her long-lost dress. 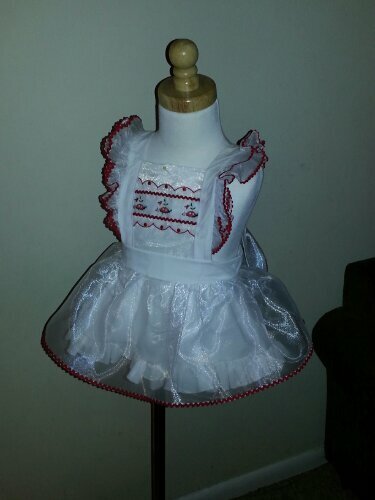 This is where the white organza pinafore with the lady bug insert and red rick rack trim on tall ruffles over an all white pettiskirt came about. 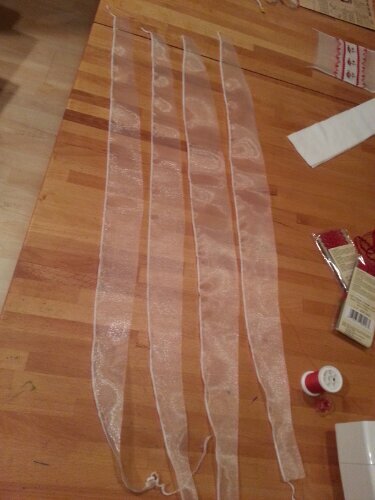 Oh, and did I mention 3″ hem and very large sash? 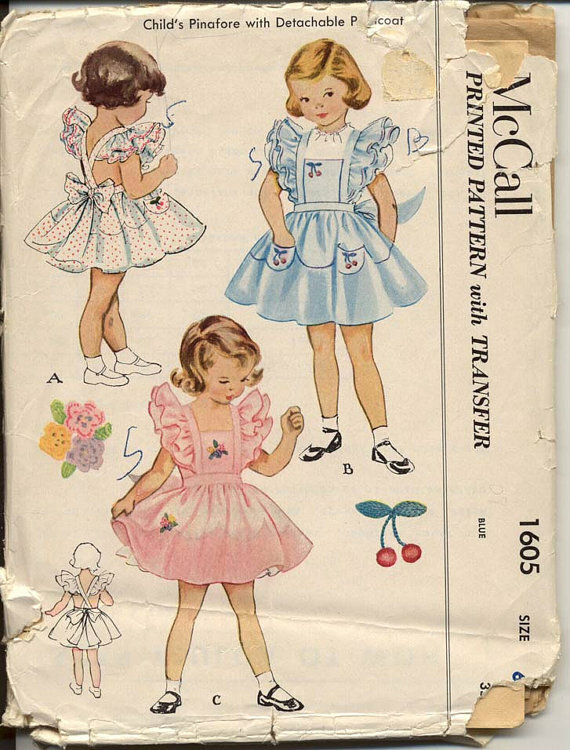 I’m working with McCalls pattern number 1605, child’s ruffled pinafore from 1951 size six. I had to majorly shrink down the pattern tissue both horizontally and vertically to fit a one year old. Suprisingly, I had no problems with the conversion (thanks to my customer for providing great measurements). 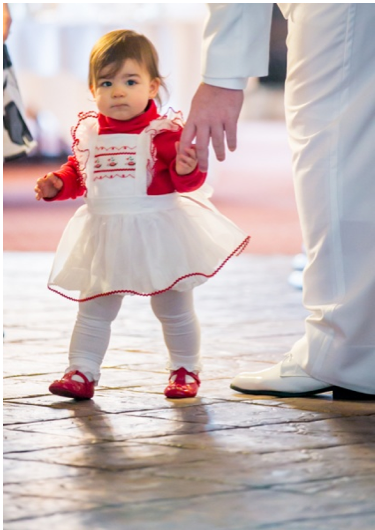 Essentially, a pinafore is a dress that can be worn over many different dresses. 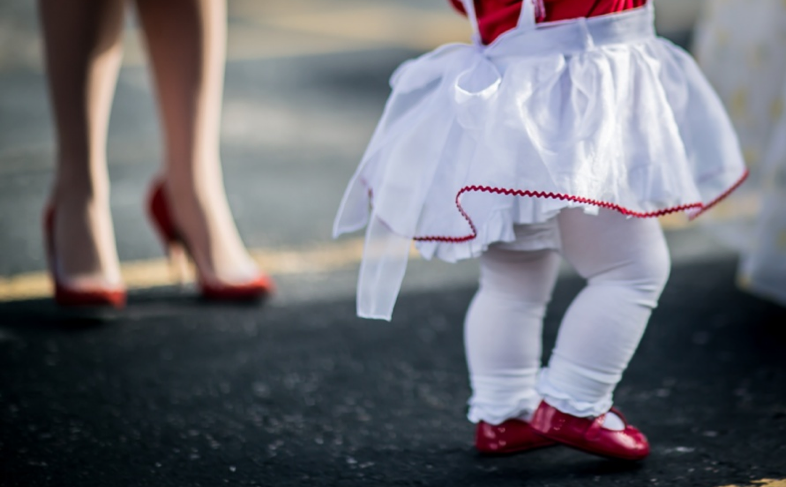 This style is a two layer dress containing the outer pinafore and the under pettiskirt. Both pieces button into one another. 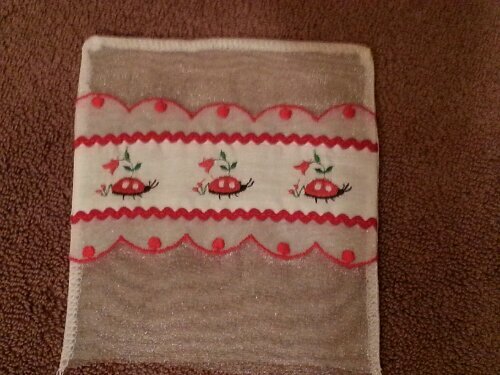 First I laid out my bib insertion design then pieced them together. Symmetry is key! 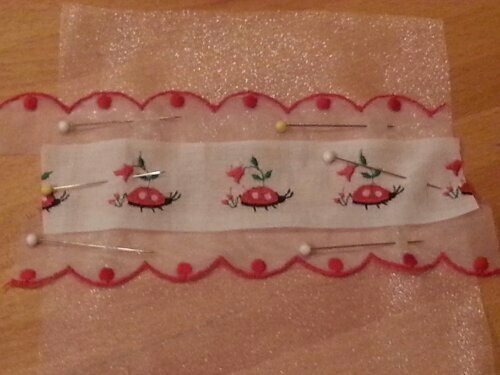 I then started with the pettiskirt and making the continuous lap (opening to the back of the skirt). Now, when I first worked continuous laps, I thought I would never make such perfect openings as my Mam-maw had. The dresses she made me as a little girl: the laps were flat and perfect. I’m happy with these laps; my best yet. 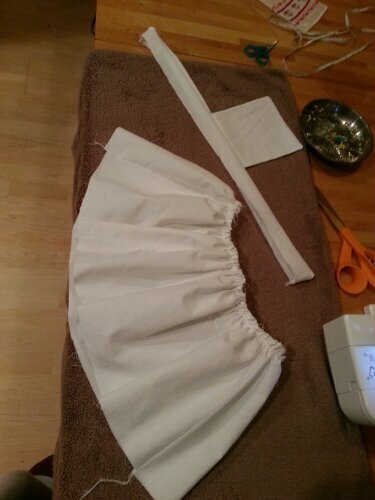 So I continue on to gather the skirt with the use of my ruffler a/k/a P.I.A. This tool is a blessing and a curse. It completely omits the old-fashioned basting stitch and pulling the threads to create your gathers but you have no idea how much it will gather. I like a uniform look so I always use it. Anyhow, I had to regather the skirt 3 times. I’ve had worse. 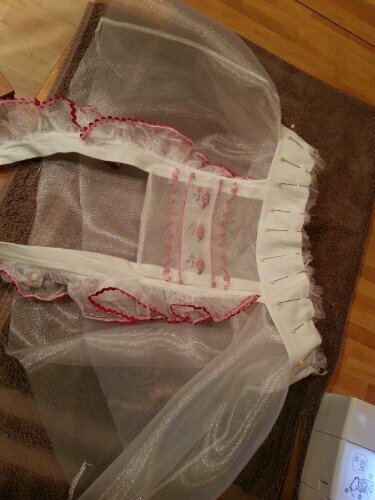 I attach the bib to the waist band and soon that will connect to the skirt. 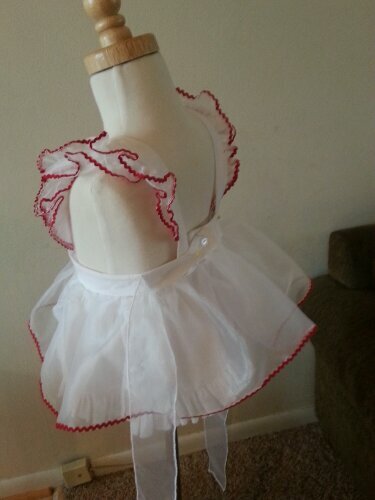 I’ve also done this with the organza lady bug bib and skirt. The organza skirt is very full since the nature of the material is sturdy and full of movement. 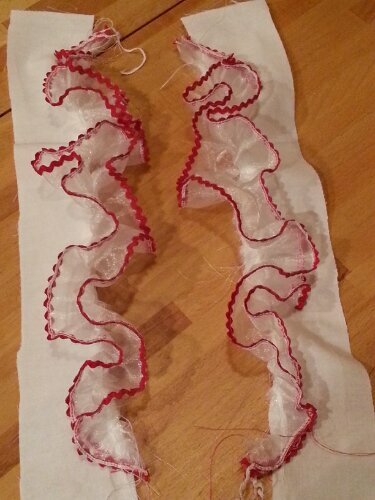 Next I work the ruffles and finish one edge with a rolled edge on my serger and stitch the rick rack over top of that. 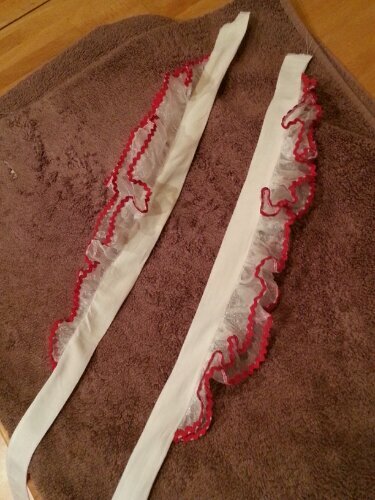 Back to the gathering foot to ruffle the strips. They really bunch up! 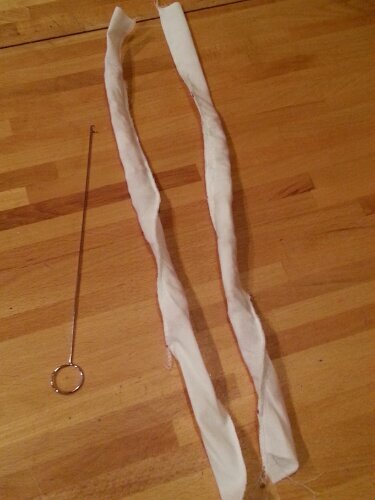 The ruffles are then pinned flat to the shoulder strap pieces; two per strap. 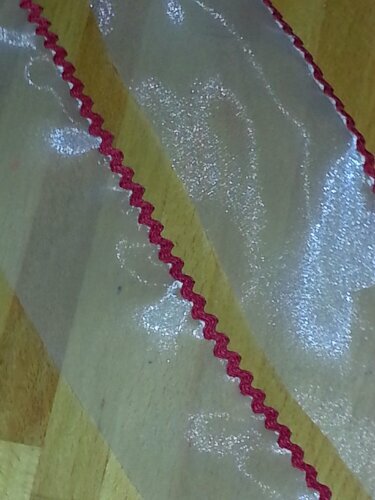 I fold them inside the strap and stitch it closed leaving ends open to turn inside out. I use a hook pulling tool. They look like long sausages and are packed tightly! 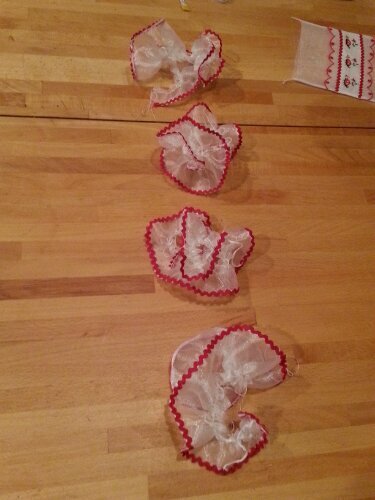 And out come all the lovely ruffles. 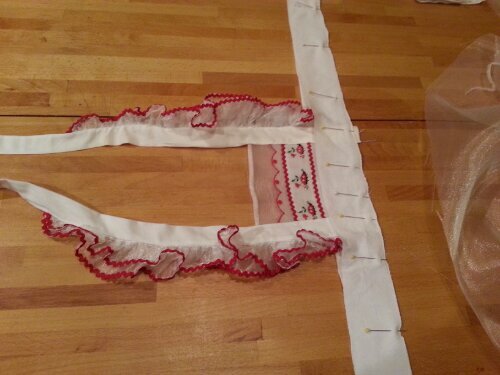 I sew the straps directly onto the bib and attach to waistband. 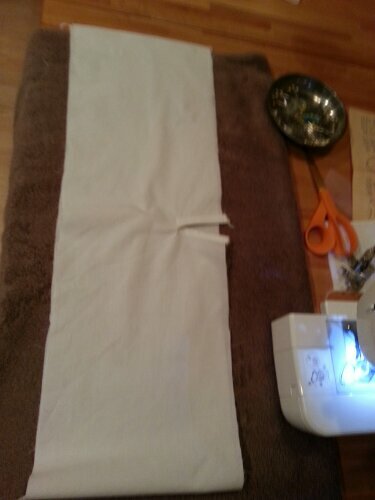 This bib is pinned to the organza skirt and I serge off a nice neat edge. 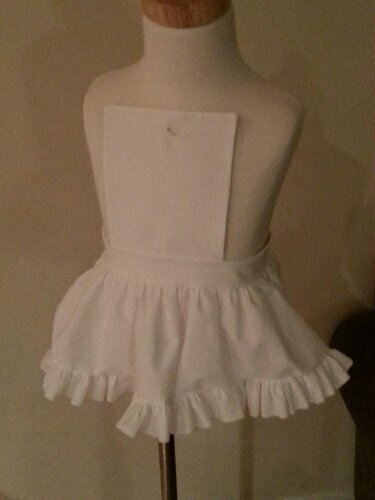 Bib is attached to skirt and done! Ready to mail.